29 years after their last album, NWOBHM band Grim Reaper has returned with their fourth studio release, Walking in the Shadows. Steve Grimmett is the only remaining member from the band’s glory days, so I’m sure there’s some legal reason as to why the band’s official name is now ‘Steve Grimmett’s Grim Reaper’. 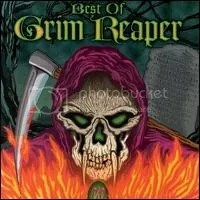 I don’t claim to be a huge fanboy of Grim Reaper, but I first became a fan when I came across their best of compilation many years ago. I’ve since listened to all three studio album in full and enjoyed them, so I was looking forward to hearing some new music. Reviews online are mixed from what I’ve seen. Some fans and reviewers have commented that the album is great, while others say it’s decent, then there’s other that say it’s terrible. I can’t understand people saying the album is disappointing or bad. First off, Grimmett can still sing. His voice has lost a little edge with age, but it has no weakened one bit. Secondly, Walking in the Shadows is a solid slab of heavy metal. Granted, I will say that there’s nothing here that has knocked my socks off, but this is still good ol’ heavy metal that’s enjoyable to my ears and it sounds like Grim Reaper to me! Grim Reaper: They rocked you to Hell, saw you in Hell and then… all Hell let loose. Kinda fixated on Hell, aren’t they? But then what do you expect from a band called Grim Reaper? Actually, with a name like that, I almost expected them to be heavier than what they are. I almost expected a more thrashy or death metal sound with a name like Grim Reaper. Don’t worry though, I prefer *this* sound. And hey, they even have a softer side as shown on the ballad “The Show Must Go On”. I got this one a few years ago on CDUniverse.com thanks to some positive reviews I had read on the band. I figured I might as well go for the greatest hits to get an idea of the band and darned if this album doesn’t include 7 of the 8 tracks from their debut along with 10 more cuts from their two other albums. Good deal to me. Grim Reaper were a cliched, cheesy 80s heavy metal and most of the songs convey that, but this is still a disc I spin from time to time just because it’s FUN.